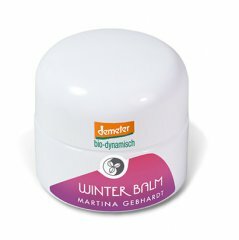 Inhaltsstoffe: Olivenöl*, Haselnussöl*, Wollwachs, Kakaobutter*, Sheabutter, Karottenöl*, Bienenwachs*, Vit. E und echte äth. Öle**. Ingredients (INCI): Olea Europaea (Olive) Fruit Oil°, Corylus Americana (Hazel )Nut Oil*, Lanolin, Cera Flava° (Beeswax°), Butyrospermum Parkii (Shea) Butter*, Theobroma Cacao (Cocoa) Butter°, Daucus Carota Oil°, Tocopherol, Aroma*, Linalool**.